Have you ever been told to get more fiber in your diet but aren’t sure how? You may have noticed dietary fiber listed under total carbohydrate on the Nutrition Facts Label and wondered how it’s different from other carbohydrates. What makes fiber so special? The list of foods above might sound familiar if you’ve ever been given suggestions for a healthy, balanced diet! Examples of foods that do not contain much fiber include: animal products such as meat, fish, cheese, yogurt, and milk, highly processed foods such as white bread, chips, candy, and sugary foods and drinks. 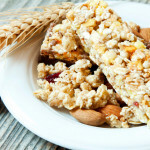 There are also products out there that have extra fiber added such as Fiber-One® bars and Activia® yogurt with fiber. While these products can be a healthy part of a balanced diet, try to get your fiber mainly from natural plant sources. Many foods that are part of a healthy diet such as veggies, fruits and whole grains naturally mix with the bacteria in your stomach to cause a reaction which makes gas. You can usually avoid this by increasing your fiber intake slowly, over time. If you still find it to be a problem, you can talk to your health care provider about taking an over-the-counter enzyme before meals, such as Beano®. Eating too much fiber too quickly can give you a stomach ache so make sure to start slow and drink plenty of water.